We now have over 900 registered flight experts on Flightfox. For the most part they help non-experts, all over the world, book the best flights. But recently, we hosted two in-house contests to show their true potential. And wow! Even we were amazed by the results. RTW, 6-Continents, Business Class, $2,569! The trip had to cover 6 continents in any order with a minimum stay of 48 hours on each continent. The experts had the freedom to pick which cities the trip will cover. The travel dates had to be between August 2012 and June 2013. The start and end city had to be the same and must be in North America. The trip had to have availability for at least two passengers. No other modes of transportation involved besides flying. Back at Flightfox HQ, we expected the best prices to come in at around $2,500 because we had already seen great things happen to our customers. This is thousands below the full price available elsewhere, Oneworld and Star Alliance Round the World Fares to only 3 continents start at $4,000. We were surprised as much as anyone when the winning entry came in, and was verified by our team, for only $1,730. Surely they missed Oceania or Africa, but no, it was all inclusive, fully bookable, and properly visiting all 6 required continents. Cities visited include Georgetown, New York, Berlin, Agadir, Istanbul, Perth, Bangkok and more. Airlines included Delta, Air Berlin, Easyjet, AirAsia and more. Travel dates started in October 2012 and ended in April 2013. Of course, most people don't travel like this. You may not have the desire to visit less developed regions or your heart is set on more romantic places. But for those adventurous souls, a RTW flight to 6 continents for just over $1,700 opens up new possibilities. Despite the impressive result, there was a common theme amongst responses to the contest: who wants to spend all that time in coach? We've certainly done it before, but given the low price, we couldn't help but wonder what would happen if we were to launch a similar contest for business class. We know the cost of business class is typically many multiples of discount economy, but my mind quickly jumped to $5,000; it just seemed like a nice round number. No minimum stay for 48 hours. Other modes of transport are allowed within continents. So we launched the in-house RTW 6-continent business class contest, and very quickly, the first entry came in at just over $10,000. Oh well, looks like we're destined for coach. But that all changed quickly, and before the contest was over, an entry was posted, and again verified by our team, for only $3,630. Cities visited include Los Angeles, Bogota, London, Cairo, Bangkok, Sydney and more. Airlines included United, Emirates, British Airways and more. Travel dates were within the month of October 2012. $3,630 for RTW business class to 6 continents?! We were floored. A quick quote with the alliances and a RTW business class itinerary to only 3 of these continents starts at $11,000. But there was more; the same expert submitted an itinerary with a quote of only $2569! The catch? We had to verify this itinerary over the phone, which contravened the original rules. Given this expert's previous entries, we have full faith it would have verified, which is quite simply amazing. So what does this mean for the adventurous travelers out there? For adventurers at least, it means we can continue to explore this crazy world, but in style. For the rest, all I can suggest is next time you consider a trip away, just give this itinerary a moment's thought. 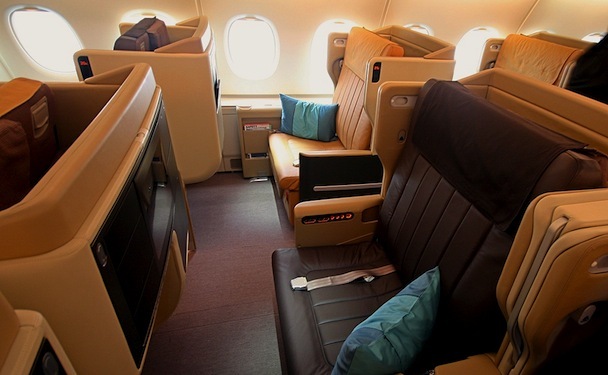 6 continents, to far away places, all in business class, with the potential for less than $3,000.